With Simplii’s one touch contact addition you can quickly and easily add contacts into any integrated CRM with the press of a button. Instead of having to navigate to the correct section of your CRM to create a new contact, you can simply press ‘new contact’ inside of your call pop window. When a customer calls into your business, quickly and easily populate their contact information into any contact addition field in your integrated CRM. If an existing contact is detected, this option will not be shown on-screen. Focus on the conversation and eliminate wasted employee time adding contacts into your CRM by adding them with just one click. Once you’ve added a contact, their information will be displayed every time they call. You won’t have to search your contact list for them by name to pull up their information! 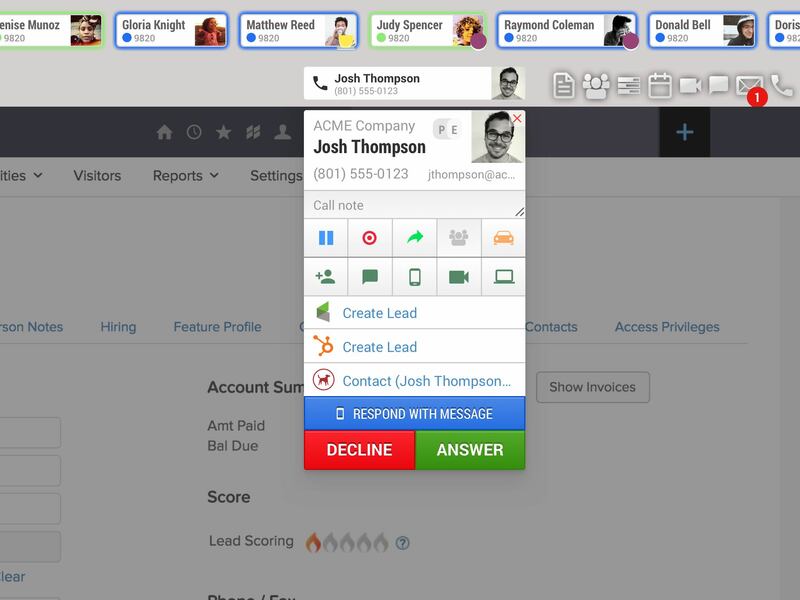 Access the contacts information in your CRM with just one click. Your CRM will then show you more detailed information within their profile. This allows employees to answer phone calls like professionals. Quickly add notes or comments to the customers CRM contact without having to go to the customers full profile. You can keep efficient and accurate records of calls and customer interactions right in your call pop window. Will one touch contact addition automatically populate the customer name and phone number in the appropriate field when I use it to add a contact to my CRM? If the customer has caller ID, one touch contact addition will populate the name of the customer as well as their phone number. If the customer does not have caller ID it will just populate the phone number and whatever additional information is displaying in that field on the call. Once they are added, you can update their name field and when they call back in the future you will be able to see their name. After the contact has successfully been added to the CRM, everytime they call into your business the contact pop will take you to that contact record with just one click. I don’t have a CRM but am interested in an easy to use contact adding tool, is there any other type of one touch contact addition? Simplii offers Fusion Contacts which can act as a basic CRM for our customers. Fusion Contacts can add contacts straight from your call pop and store them on your FusionContacts page. Fusion Contacts can store information such as name, phone number, business, and basic notes.